A Kalahari Cheetah. Not tonight’s Kalahari Cheetah. Some other Kalahari Cheetah. And the trend for ‘strange’ continues in the Kalahari. Tonight’s sunset drive left me in awe again. On our way home we stopped to watch a jackal. By this time it was completely dark. No moon, no stars, just dark and rain and thunder. Good weather for jackals. Not good weather for much else. And yet moving the spotlight a few meters to the right of the jackal as we were about to leave, revealed a cheetah. A cheetah panting over a freshly killed springbok. Cheetahs are active by day. They hunt during the day too. And there’s a good reason for this. In the light, there aren’t so many other predators walking about. Kalahari cheetahs can lose as many as half of their kills to other predators. Brown Hyenas are one of their biggest bullies. And the night is when the Brown Hyena is on the prowl for a free meal. 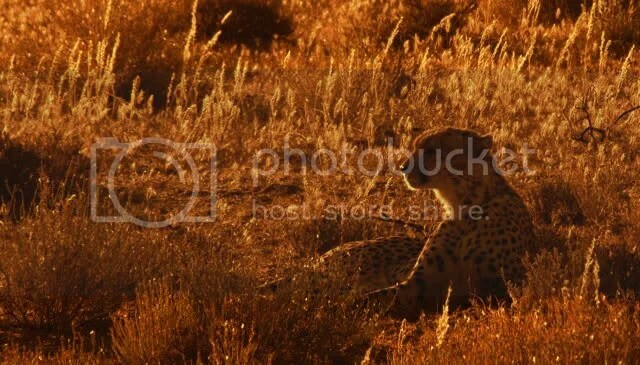 There’s no freer meal than a dead springbok guarded by lone cheetah struggling for breath in the darkness. Tonight’s cheetah took countless risks and did what few cheetahs are ever prepared to do. The least we could do was turn off the light and give it some dark. Any predator anywhere nearby wouldn’t hesitate to take the kill away- or worse. In a situation like this, ethics must always come first, even if it means missing out on a big cat sighting. We couldn’t give away the cheetah’s vulnerable position. After i’d taken ten minutes to explain all of this and more to my guests (and they all agreed about the ethical bit- hooray), we had a quick scan with a dimmed light to see if the cat was still there. Fortunately, it had dragged the springbok into a dip and long disappeared. I hope more than anything that it got the meal it deserved. The last few days have been full of so many unexpected surprises from animals that haven’t bothered to read the mammal behaviour books. So what’s next….? Thanks Mama Bear. I miss you too!